Create a fabulous contemporary look in your dining room or bar area with this gray bar stool. It has been upholstered in a sleek gray material and features a striking flared back. Combine this gray bar stool with the counter table from this collection for a complete set. The Stanton 24 Inch Gray Bar Stool by Coaster at Wilcox Furniture in the Corpus Christi, Kingsville, Calallen, Texas area. Product availability may vary. Contact us for the most current availability on this product. The Stanton collection will give your contemporary casual dining room a bold update. With its unique wave design and different chair options, you can mix and match to create the perfect look for your home. 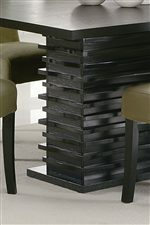 Made from ash veneers and finished in a rich black, the Stanton collection will be a fabulous addition to your dining room. The Stanton collection is a great option if you are looking for Contemporary furniture in the Corpus Christi, Kingsville, Calallen, Texas area. Browse other items in the Stanton collection from Wilcox Furniture in the Corpus Christi, Kingsville, Calallen, Texas area.